Two boys go for a walk together and the boy with sight describes colours to the blind boy. Includes brief factual information about guide dogs. Suggested level: junior, primary. Dawn McMillan lives in a small coastal village on the western side of the Coromandel Peninsula. 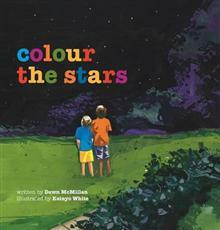 Colour the Stars emerged from a time I spent beside a tumbling bush stream, where it seemed that Isaac and Luke were with me. It gives me great pleasure to donate my royalties from the New Zealand sales of Colour the Stars to the New Zealand Foundation for the Blind, to assist with the Puppy Training Programme. Illustrator Keinyo White is an honours graduate of the prestigious Rhode Island School of Design. He has been working as a professional painter and illustrator for more than 15 years. He now spends his time between Christchurch, NZ, and his hometown of Washington DC, USA.